Rabbit Heart 2017 Tickets are Now On Sale! YaY – All-Access tickets* for Rabbit Heart Poetry Film Festival 2017 are now available! You can score yours today at the Doublebunny Press Store. Rabbit Heart Poetry Film Festival Submissions are Open! Sister! Sister! It’s poetry movie time again! Submissions for Rabbit Heart Poetry Film Festival are now open. Deadline: July 1st. Rabbit Heart 2016 Tickets are Now On Sale! It’s on, y’all! Tickets for Rabbit Heart Poety Film Festival 2016 are now available! You can pick yours up today at the Doublebunny Press Store. Looking forward to sharing poetry movies and popcorn with you at Nick’s on the evening of Saturday, October 22nd! Rabbit Heart 2016 is Coming! Save the date – Rabbit Heart Poetry Film Festival will be at Nick’s again this year, on Saturday, October 22nd! Rabbit Heart Poetry Film Festival is BACK! Tickets are now on sale for the Showcase Matinee and Kickoff on Saturday, October 11th, and for the gala Awards Ceremony and Viewing Party, and you can get them right here. Last year was Amazing – so much great work on the stage, and trophies and popcorn and fancy dresses, and Tony Brown and Melissa Mitchell emceeing and and AND – omigod, come join us again this year – it was a BLAST! 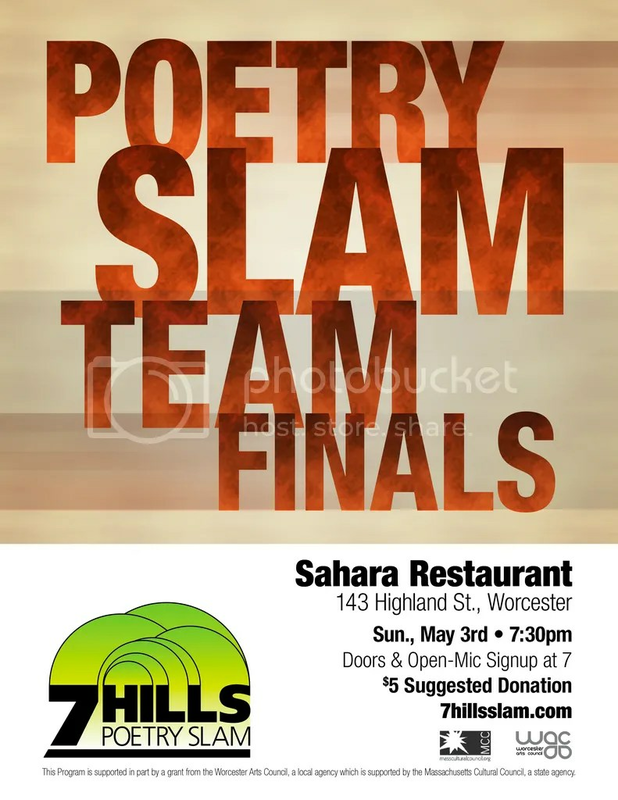 Sunday – Finals for the 2015 Worcester Slam Team! Unbelieveable – we’ve made it a whole season of slams at the Sahara, and now it’s time for finals! 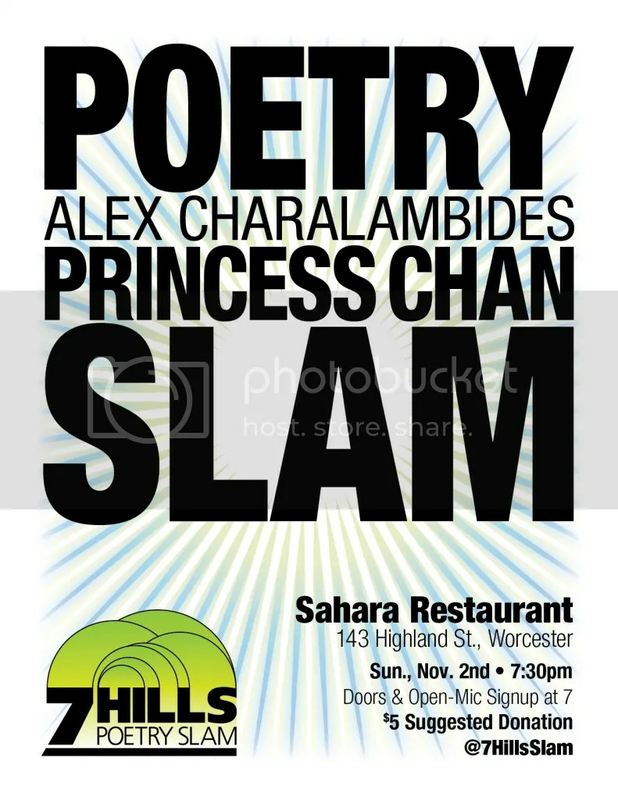 On Sunday, Colin Killick, Rushelle Frazier, Ava Molnar, Sarah Sapienza, Robert Blackwell Gibbs , Jenith Charpentier, Ashley Wonder, and Nicole Zajon will square off to see who’s on the 2015 Worcester Slam Team. See you there! You know about the new show in town? Staffed by veterans of the Asylum, the Dirty Gerund, MassLEAP, and Ballard Street Poetry Journal, among others, come to Sahara on the first Sunday of every month for a spectacular open mic, feature, and slam. Doors at 7, show at 7:30. More info at their website, here.